Our Mission: To provide an outdoor experience for Guests that creates memories of wonder, thrill and comradery. SkyPark aims to achieve this by providing Guests experiences through adventure based activities in an alpine forest nestled in the San Bernardino Mountains. 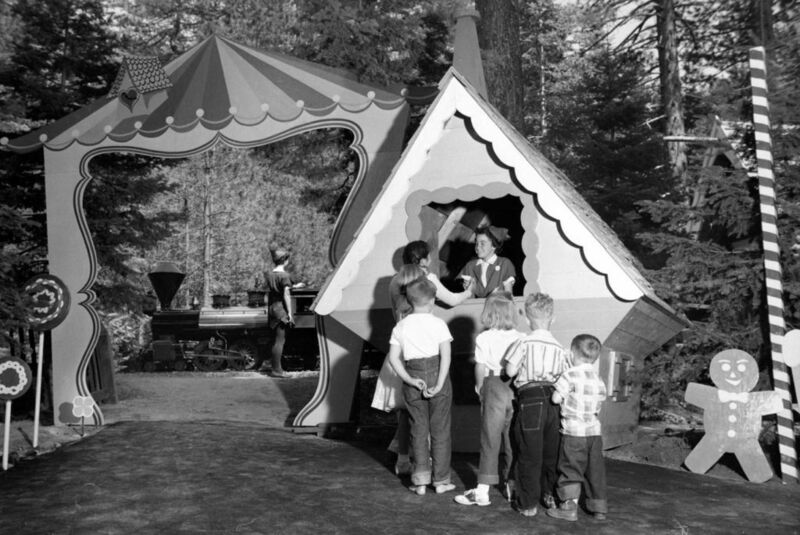 Santa’s Village was opened just six weeks before Disneyland on Memorial Day weekend in 1955. The original idea came from a Saturday Evening Post article that was written about a Santa’s Village in New Hampshire (which still operates today). 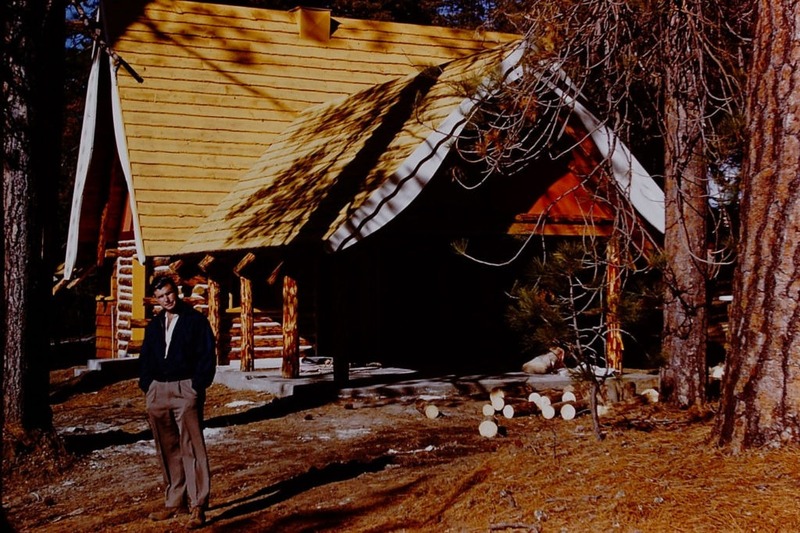 Local Crestline resident Glen Holland proposed the idea to investors and broke ground with Putty Henck as the general contractor in 1954. 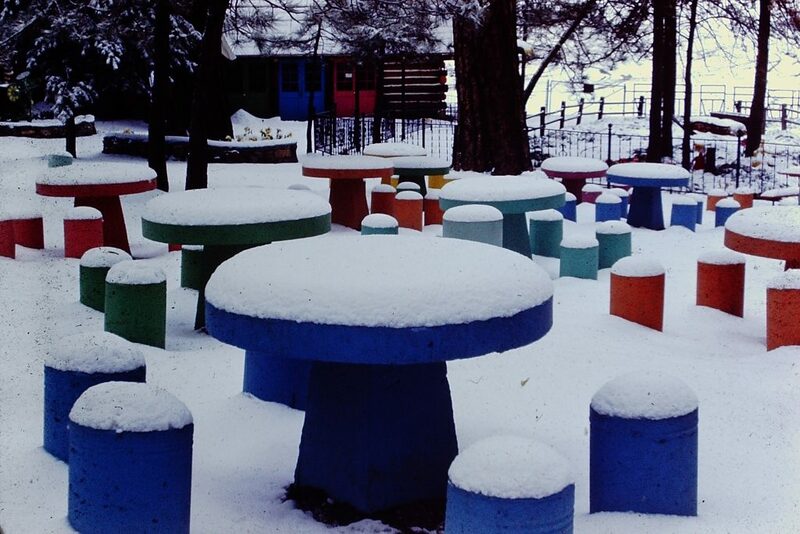 They worked closely with local artisans and craftsman to create the whimsical Village. Hand built with local timber, construction began in earnest in 1954, with many of the main players doing much of the hard labor. 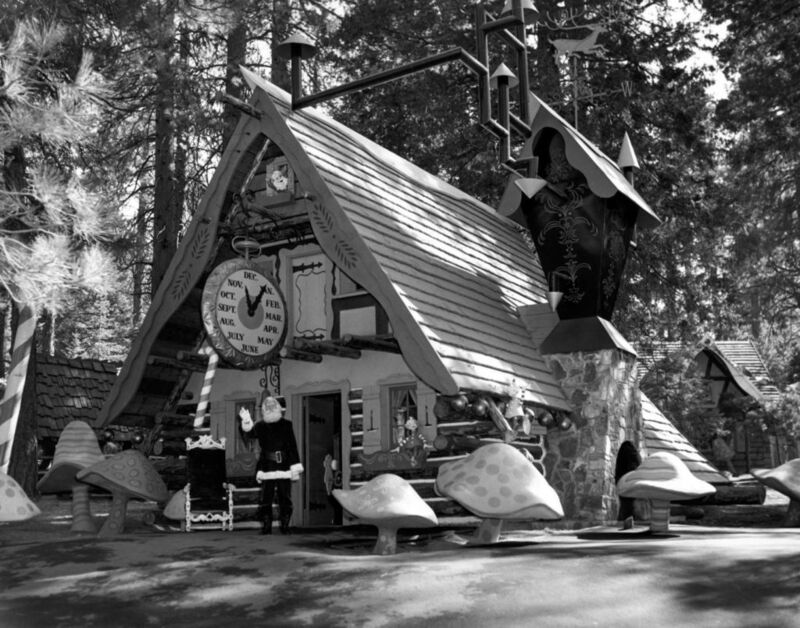 Many Southern California residents have visited Santa’s Village as children. This iconic Christmas experience was a tradition for many families during the holiday season. 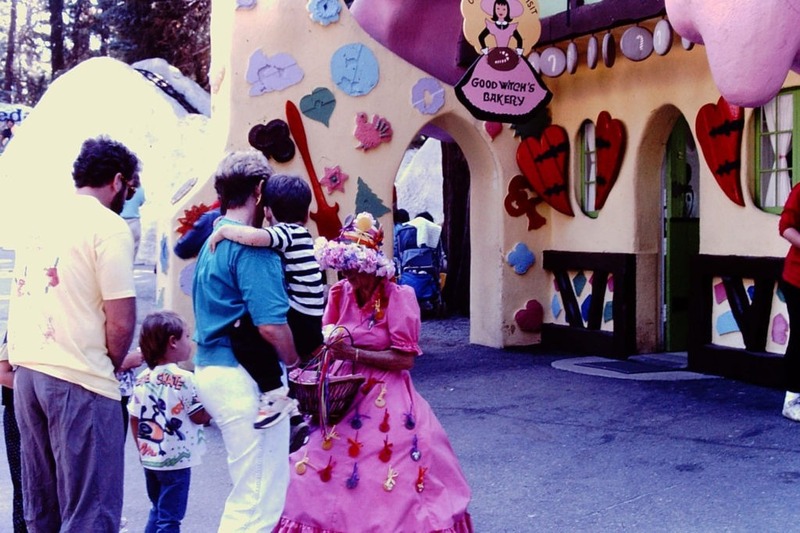 It is estimated that over 5 million people visited Santa’s Village during its 43 years of operation. Santa’s Village also employed many of the local population during this time. 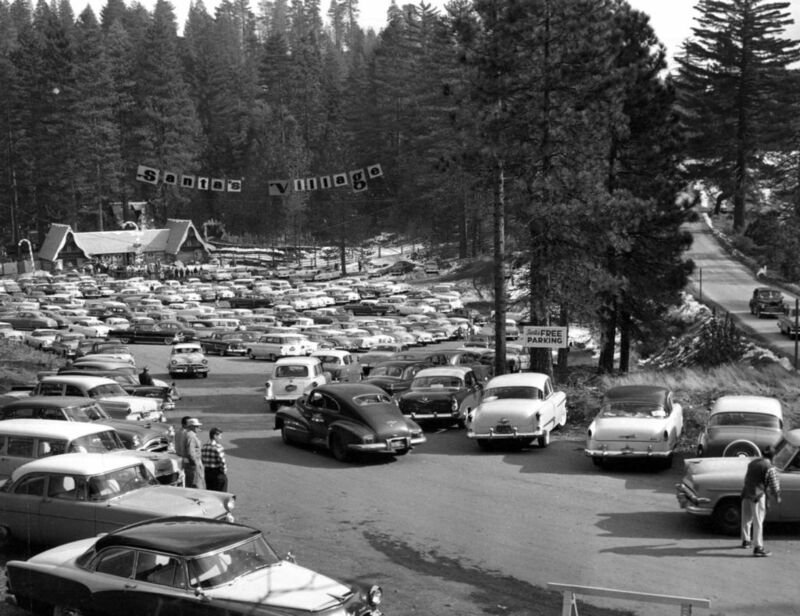 The original Park was built on 15 acres of the total 230 acres, which were leased to Santa’s Village by the Henck Family. The Park operated for approximately 23 years in this capacity. 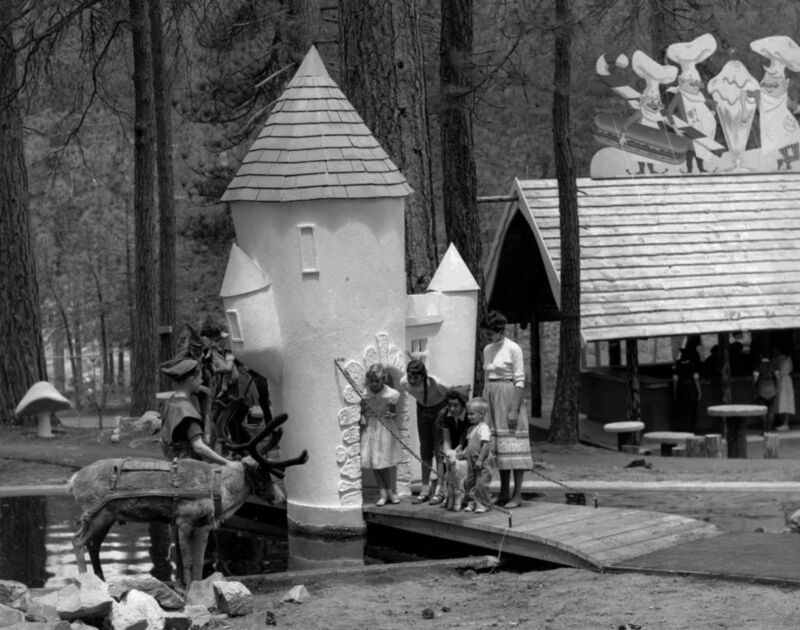 Glen Holland went on to build two more Parks; one in Santa Cruz, California and one in Dundee, Illinois. Santa’s Village would become the first franchised theme park in the country. 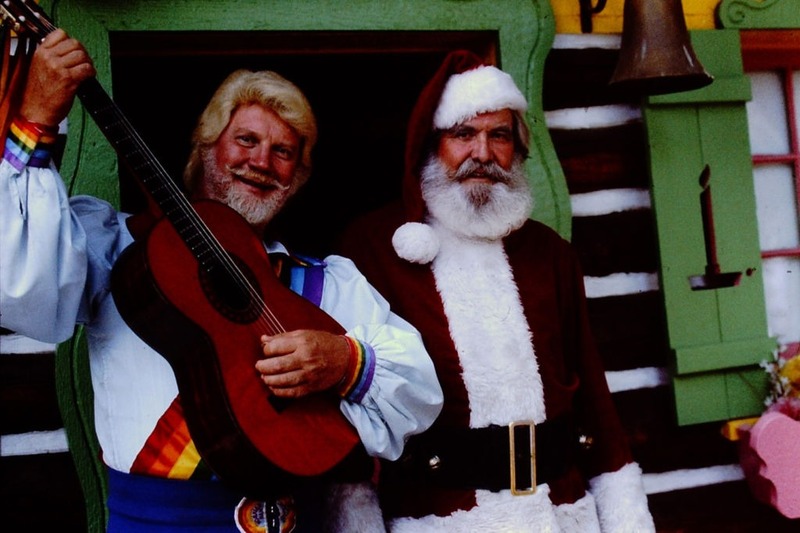 When the Santa’s Village franchise went bankrupt in the late 1970’s, the Henck Famly was able to purchase Santa’s Village because it was situated on their land. 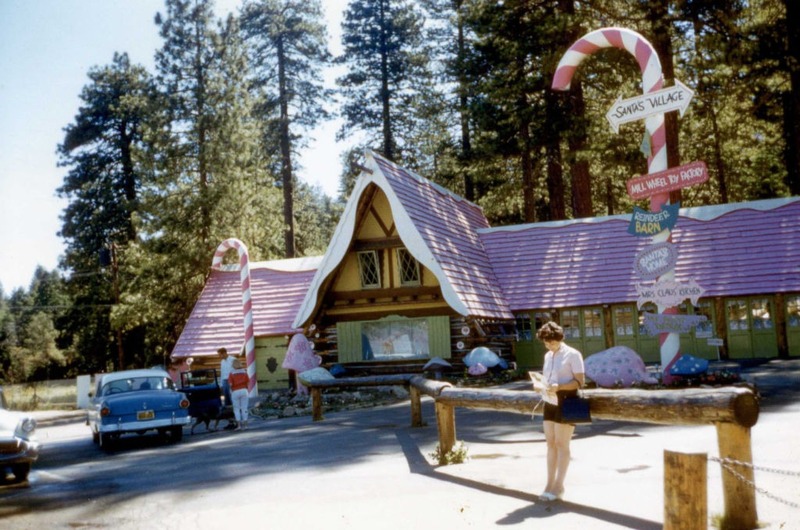 Pamela and Putty Henck were able to operate and expand the park to include more rides, horseback riding, and nature trails which they called “Fantasy Forest at Santa’s Village.” They made the business successful until eventually they had to close in 1998. The Henck Family then decided to auction the rides and fixtures. Many of these items can be seen around our local communities. Putty Henck in front of "The Pixie Pantry" 1954 Now "St. Nick's Patio & Grille"
Putty Henck and Glen Holland in 1954 at "The Mechanical Toy Shop." 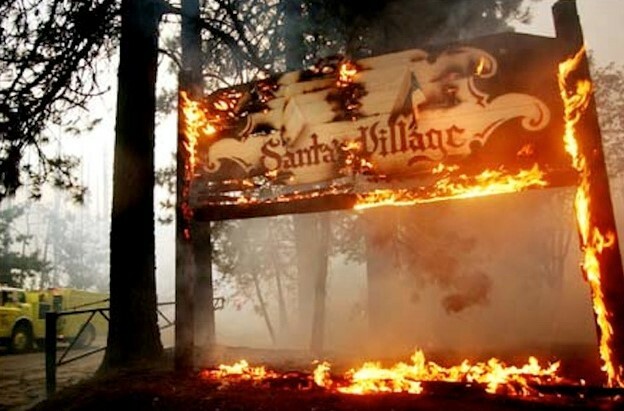 After the closing of Fantasy Forest at Santa’s Village, a new owner attempted to reopen the village. 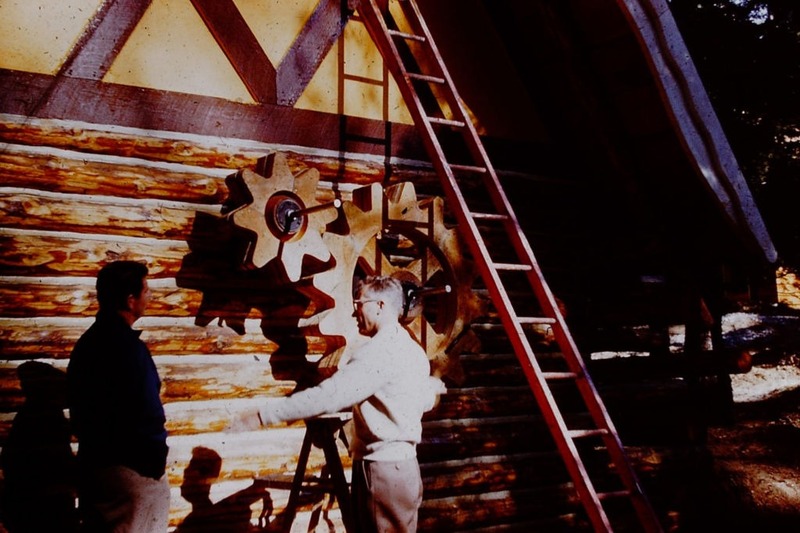 He brought in a local contractor, John Radleigh and began restoration of many of the structures. We are grateful to the Plott Family and the efforts of John Radleigh. Because of their efforts in restoring the roofs and windows of most of the buildings, they prevented further degradation of the historic structures and most likely saved the buildings from the fire that would ensue a few years later. 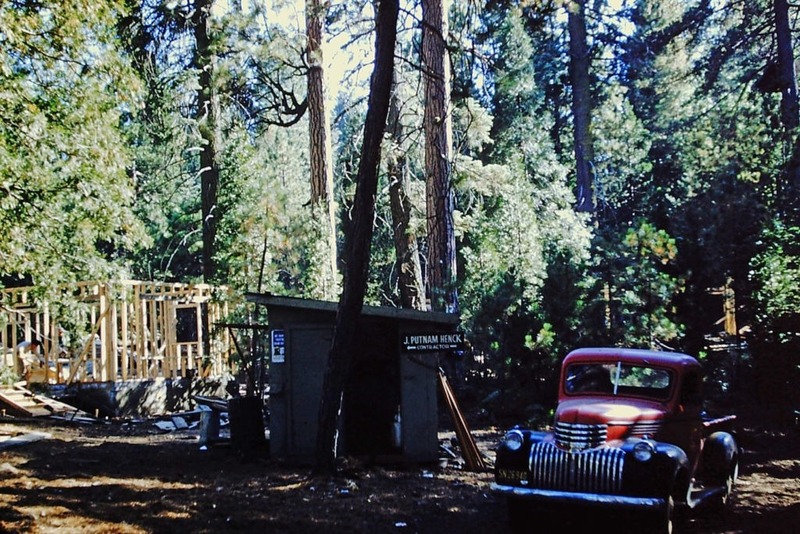 Started by arson in old Waterman Canyon, the “Old Fire” took just eight days to rob six lives, displace thousands and scar the area to this very day. See what we’re doing to help restore, protect and preserve the Park’s natural eco-system and beauty. The “Old Fire” of 2003 was one of the worst wildfires in state history and ravaged much of the property and its neighbors. If not for the extraordinary staging efforts of local fire agencies, the Village would have been destroyed. The fire was exacerbated by a previous bark beetle infestation that weakened the already drought stricken trees. The Santa’s Village property was chosen to store and process millions of infested logs. 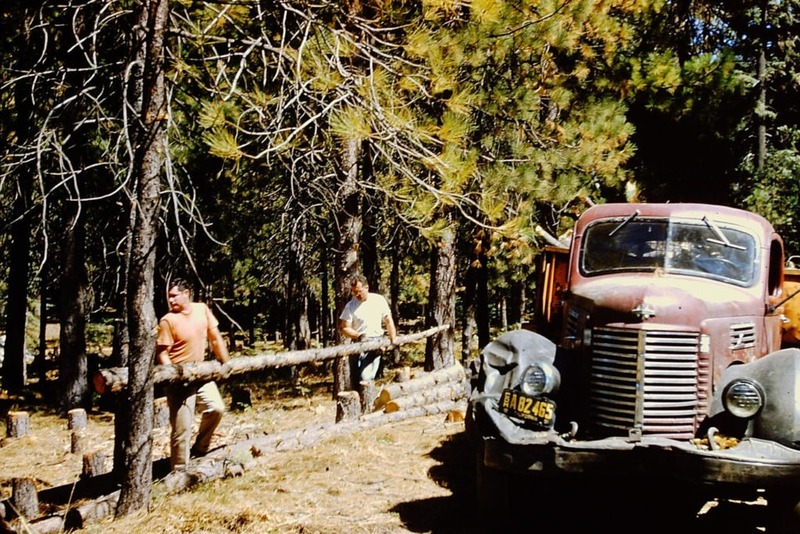 This was not the most environmentally friendly use of the property as it was leased to a logging operation and its abuse of the land is still evident today in many areas. Restoring the historic qualities of the Park are paramount in our efforts as well. Bringing Santa back to his Village is also very important to us. He is why we are here in the first place! Santa is at the Park all year. He will be actively participating in our outdoor activities. Every year, SkyPark at Santa’s Village transforms into a dazzling Christmas Wonderland. Experience the nostalgia of an “Old World Christmas in the Woods” with your family and friends and create memories that will last a lifetime. We’ve spent our lives in the Mountain Communities; enjoying the beauty and active lifestyle, managing our businesses and mentoring our youth. Our vision was born the day the Santa’s Village property became available. We envisioned a way to share these beautiful mountains and all they have to offer that would entertain, energize and educate and we knew from history that the Santa’s Village model was not sustainable. What makes our vision sustainable is the summer time offerings the original Santa’s Village didn’t have; mountain biking, fishing, hiking, ziplining and our comprehensive education programs. We offer rich and diverse curriculums such as Outdoor Education, Environmental Education, Pathways Programming and so much more. SkyPark at Santa’s Village promotes clean living, an active lifestyle and conservation in a fun and interactive exchange with the environment. Santa is obviously key to our vision as he lives and plays at the Park year round and is always excited to share his magical home with Guests. We are custodians of this magnificent land and we take that responsibility seriously. With that responsibility comes an opportunity to excite, to entertain and to teach. The vision that is SkyPark at Santa’s Village.